Ships today if you order in the next 1 hours 2 minutes. Auto Ship & Earn + 136 Points What's this? 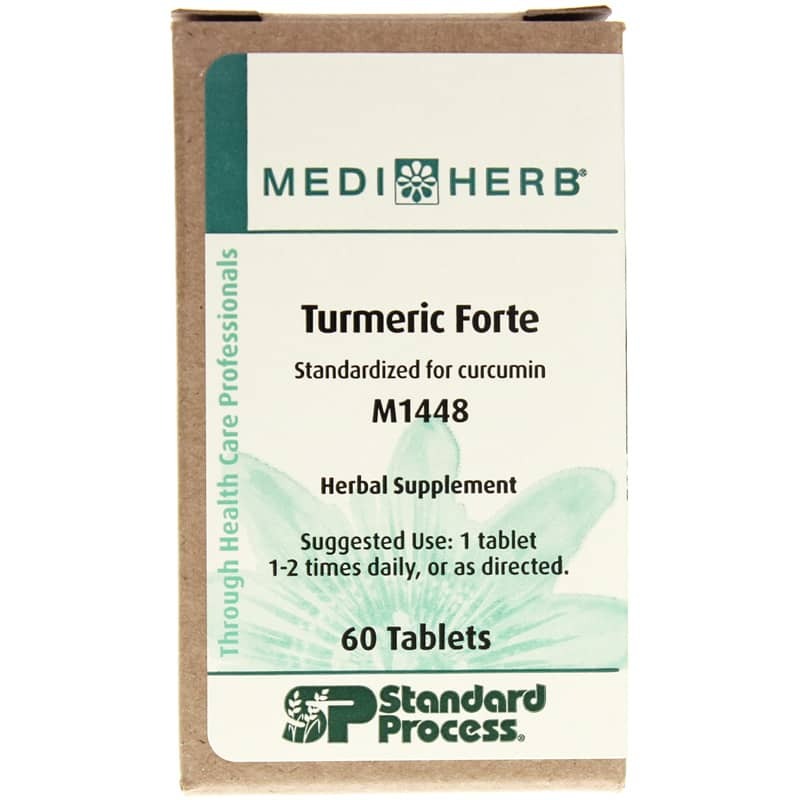 MediHerb Turmeric Forte from Standard Process is a formulation of Turmeric rhizome and Fenugreek seed extracts to enhance absorption and improve bioavailability of curcuminoids, the active constituents of Turmeric. Turmeric rhizome provides turmeric curcuminoids, including curcumin, demethoxycurcumin and bisdemethoxycurcumin. This product is standardized to total curcuminoids and to curcumin, to ensure optimal strength and quality. Other Ingredients: Cellulose, croscarmellose sodium, sodium starch glycollate, magnesium stearate, silica, hypromellose and calcium phosphate. Adults: 1 tablet 1-2 times daily, or as directed. I give one a day to my dog for her elderly aches. She used to avoid going down the stairs and jumping out of the car. Now she is back to her old self. So happy to see her move much easier! I have been taking one tablet per day with positive results. I have had chronic inflammation for decades. This is the first time I have gotten joint pain relief and increased mental clarity from taking any supplement. I had heard before ordering any that this Standard Process formulation increases the body's ability to absorb and use the turmeric. That does seem to be the case! Purchase was swift, delivery was fast.<br>More important however is that the effect of using the product is easily noticed.